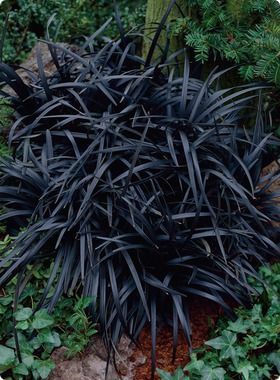 Shade garden - Black Mondo Grass. I absolutely LOVE this stuff. Shade garden - Black Mondo Grass. I absolutely LOVE this stuff. Imagine it growing as a border for flowering plants with bright colors. Also makes a great mass planting surrounded by a stone border. Or in planters or flower boxes for contrast.